The first episode of Ant And Dec's Saturday Night Takeaway to air since Ant McPartlin was charged with drink driving has been broadcast. We already knew - from a tweeted image of the script - that the title wasn't changing. But how would Dec do presenting without his on-screen partner of 30 years, Ant McPartlin? Let's get the big question out of the way first. Could Dec cope without Ant? And the answer was - yes, generally very well. There's no denying that he was nervous to begin with - the tension visible in his body language; his speech was that slight bit quicker than usual. But he was welcomed to the stage with a massive roar from the audience, and having got into the groove with the usual catchphrases, he nodded to Ant's absence, noting: "I've got twice the amount of work to do." And the nerves were understandable. He had no more idea than anyone else how Ant's future might pan out - and he could hardly afford for the general impression to be that he is useless without his partner. At the very least, he isn't. "We don't just wing it, there is actually a script!" the show tweeted in advance. And that script was very good. This would have been the most challenging of weeks for the show's writers - required to write material that addressed Ant's absence without seeming too light-hearted. But for the most part they got it exactly right. "Have you been keeping a close eye on this week's news?" Dec asked a quiz contestant. When she said she hadn't, he replied, "for some of us, it's been unavoidable". And in a very self-referential moment, Dec actually ended up in the show's writers' room at one point, saying: "I'll have to do it myself. Like everything else around here this week." The cheer from the audience nearly took the studio roof off. Good job it is being decommissioned. 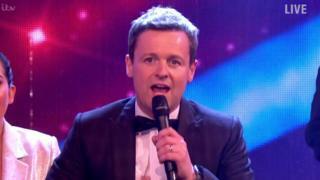 Dec's friends were not just that supportive audience - there were many on the studio floor with him. Davina McCall, Cat Deeley and Takeaway regular Stephen Mulhern all popped up to set up a gag or help carry a section. But it was Stephen Merchant, doing the voiceover for the Terms And Conditions, who was the star. After watching a pre-recorded Knight Takeaway segment - the only time Ant appeared on screen - he observed: "I enjoyed that. That other bloke was good. You should do more with him." He also mined the old-as-time, but no less funny, little-and-large gags to be had from the enormous height difference between himself, at 2.01m, and Dec - 1.68m. Referencing Dec's wife's pregnancy, Merchant looked forward to "the pitter-patter of tiny feet. It'll be you coming to the door." Never mind Ant and Dec, at times it was like the Two Ronnies never went away. The show's producers, knowing that there would be a lot of emotion in the studio, decided to make a slight shift in tone. Overall - especially in the first half - there was more an emphasis on heartstrings than humour. Davina McCall's bit in particular - a sort of update of the old Cilla Black Saturday night show Surprise Surprise - featured a woman whose three children all took on enormous personal challenges. A woman who was meant to be on the show a few weeks before but had had to pull out after having heart problems, no less. One of her children learned to sing, one learned to fly - but then the third went and found her adopted half-sister, whom she had never met. Judging from the reaction on social media - just follow the #SaturdayNightTakeaway hashtag - it seems impossible to overestimate the amount of goodwill that Britain has towards Declan Donnelly. Both his audience and the country seemed squarely behind him - albeit sometimes in the way that close friends cheer on an anxious best man as he makes his first speech, which, in some ways, seems a strange way to feel about a man who has 17 successive Best Presenter Baftas on his mantelpiece. But when Merchant said, "sorry mate, I was just trying to fill in some time for you," it summed up the feeling around this slightly odd, but generally perfectly entertaining, piece of television. You couldn't quite shake off the sense of something being nursed to the end, like Charlie Sheen being guided into land at the end of Hot Shots, his plane shedding parts by the second. Ironically, it was a pre-recorded line that summed things up best, from the Knight Takeaway sketch. Having just unleashed a massive fart, his oven-ready character declared, "Tell you what. Now it's finally out, I feel a whole lot better."